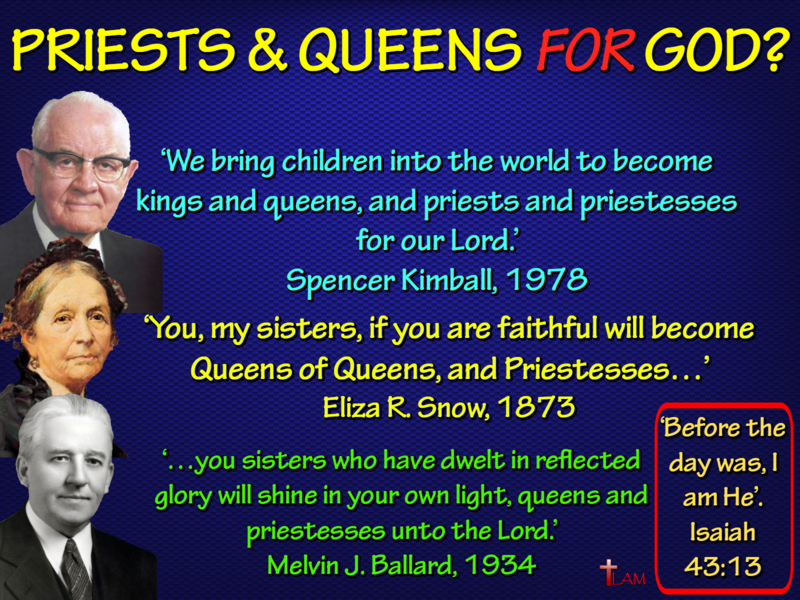 PRIESTS AND QUEENS FOR GOD? One important thing to keep in mind when understanding Mormon doctrine: pay attention to little details. The Mormon Church teaches its members they’ll become kings and queens for God, but the Bible says no such thing. Stating that we could be kings and priests for God implies God isn’t sovereign, and in fact has someone, or something, ruling over Him. Furthermore, the idea women will be queens in heaven is reminiscent of biblical days when Judah was worshiping Ashtoreth the fertility goddess, whom they falsely believed was the ‘Queen of Heaven’! The three LDS examples we’ve shown below are nothing more than idol worship. Believing you can become a god/goddess someday is blasphemous, and can’t be found anywhere in the Bible my friend! Isaiah 43:10-11 is a great passage Christians can use when explaining there are no other gods except the One True God of the Bible. Be sure to share this with the Mormon you know! Ensign, ‘Train Up a Child,’ April 1978 “We do not rear children just to please our vanity. We bring children into the world to become kings and queens, and priests and priestesses for our Lord.” – Also see, The Teachings of Spencer W. Kimball, p.331.